The ultimate do-anything laptop, the new MacBook Pro will be the high-end choice for most – and rightly so. It’s fair to say there’s been a few negative reactions around Apple’s new MacBook Pro line-up. There’s a (somewhat worthwhile) school of thought that says this laptop should have been a new MacBook Air, with Apple announcing a workstation-level notebook called the Pro. Naturally this would have also come in for some criticism. But it’s clear that Apple does not see itself as a mainstream supplier of notebooks. It’s somewhat odd to think of the MacBook Air as old hat, but that’s what it is, the closest thing Apple has to a mid-ranger. Here we’re looking at the Touch Bar version (which comes in 13 or 15-inch sizes, available in Silver or Space Grey) but there’s also a base-level MacBook Pro without TouchBar and with only two USB-C Thunderbolt 3 ports that shaves £300 off the 13-inch TouchBar price. What’s incredible about all the new Pros is that they’re the same thickness as the rear of the MacBook Air but with retina display and far more power. Except for a small subset of users, these truly are do-anything devices. They borrow the best new features from the 12-inch MacBook, drops all ports (save the headphone jack, still needed in PCs and Macs) in favour of four all-purpose USB-C Thunderbolt 3 ports, boasts a massive trackpad and maxxes out at 16GB of memory (this is the maximum of low power memory allowed by Intel’s Skylake platform). The stunning retina display continues to astound, especially with the 15-inch version – and in these Macs the retina display has a wider colour gamut, too. The keyboard takes a bit of getting used to, but it’s an improved version from that in the 12-inch MacBook. The 15-inch features quad-core Intel Core i7 chips, the 13-inch a still-speedy 2.9GHz Core i5. The limitation of 16GB of low power memory isn’t ideal for some people who would have considered this notebook. But it’s a small amount of people – for many, 16GB will do fantastically. And all models are 8GB by default, anyway. Apple believes that the speedy 256GB or 512GB SSD drives used here (3GB/s write) means that these Macs can page the drive as extra memory without a performance hit for all but the highest-demand user. But USB-C (which incorporates the new Thunderbolt 3 tech here) is no ‘maybe’. It is reality. Every notebook in this class as well as ultraportables will boast USB-C exclusively within months. The HP Spectre 13 is a prime example of this. 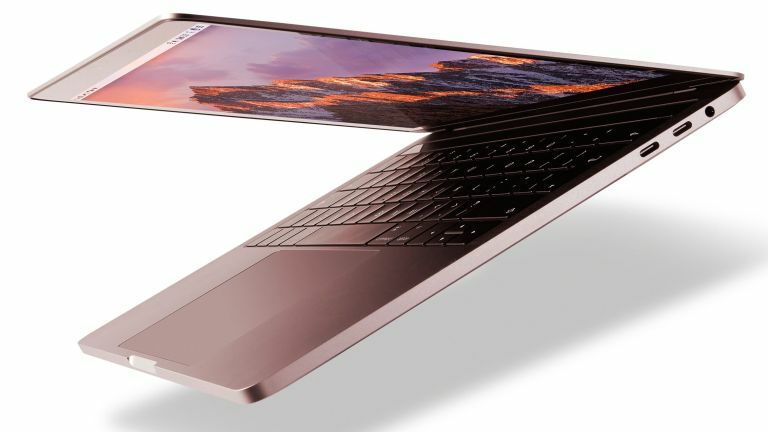 It’s a little embarrassing for Microsoft that it says ‘Surface Book is the ultimate laptop’ when even the new second generation unit still eschews USB-C.
Let’s also not forget that Apple is no stranger to changing things up. From no headphone jack on the iPhone 7 to no floppy drive in the original iMac, it’s always been ready to move on. Let’s get one thing straight – the move to USB-C is no bad thing. With the original Thunderbolt - which ran through Mini DisplayPort - Apple was way ahead of the curve and it struggled to catch on with other vendors. USB-C is a great solution for connecting devices as well as for video with a second monitor. But it’s also great for charging, but it doesn’t come away as easily as MagSafe did (to prevent your Mac from ending up on the floor if someone trips on the cable). Apple reckons that the loss of MagSafe is just one of those things that has to go because, HEY PROGRESS, but there is a truth when it says that you will rarely need to charge these things. If you can get 10 hours out of a laptop or 30 days standby, will you really charge it in every coffee shop or meeting room you go into? No you will not. There is a little issue with using USB-C for charging, and that is that not all USB-C power adapters have the same 87W rating as the charger that comes with the new MacBook Pro 15-inch. Other chargers (like the 61W version that comes with the 13-inch) can be used, they just won’t charge so fast. One really cool thing is that you can use any USB-C port for charging – but no, you can’t charge from more than one charger. The second charger you plug in will be ignored! One of the added benefits of USB-C is that it enables the whole thing to be lighter and thinner than retaining legacy ports. And if you’ve ever lugged a MacBook Pro around in a bag, you’ll know how great that is. The disadvantage is that you’ll need an adapter, but you don’t need to buy Apple’s official stuff – we’ve got a USB-C to HDMI and USB 3.0 hub we bought off Amazon for £20. It works brilliantly. However, we think you will definitely need to buy one cable if you have an iPhone – a USB-C to Lightning cable. We got caught without one and couldn’t charge our iPhone 7 Plus. Apple has clearly decided that its Macs shouldn’t have touchscreens and this has resulted in the Touch Bar. That’s all well and good, but Microsoft has finally made touch useful with Windows 10 and more and more of us expect to be able to touch screens, especially children who are now used to touching the screens of devices like Apple’s own iPad. The simple fact is that, at some point, the Mac will have to be touch-enabled. Maybe Apple just doesn’t feel macOS is up to it yet. Maybe it will require a merge of macOS and iOS to make it happen. Whatever, Apple has clearly decided that the Touch Bar is an effective tool for now. One great thing about the Touch Bar is that it is beautifully app-specific – and even more granular within that. If text is selected, it’ll show you the text tools – that kind of thing. You can customise the small section of system controls on the right-hand side of the Touch Bar, known as the Control Strip. When editing the contents of the strip, the icons wobble, just like on your iPhone. When you add something, you can change it position by dragging it on the Touch Bar in this view – this is super cool. And you’re also able to select what appears in the collapsed view, as well as what appears in the full expanded Control Strip view. This level of customisation is what Apple is hoping will make the MacBook Pro irresistible to power users. This goes some way to dealing with one of the issues of the Touch Bar – you don’t quite know if the feature you need will be there, a bit like using 3D Touch on your iPhone. Pressing the Fn key brings up the function keys on the Touch Bar, but you can change this to make sure it shows the expanded Control Strip should you wish. The Escape key is pretty much always shown, one for the eye for those who said Apple was losing it because of the physical key’s absence. If there is a problem with the Touch Bar it is that it’s not as natural to use (yet) as the trackpad is – or keyboard shortcuts. After all, for many apps, Pro users will know how to make things happen without resorting to the trackpad. Will the Touch Bar change this behaviour – and is there any reason to? But it does put more at your fingertips – and not everything has a simple control, after all. Changing a colour from a colour picker, for example, is way easier with the Touch Bar. It will also be great for those of us who take pride in a clutter-free screen as there won’t be quite the need to have so many panels open in popular apps. And, if we’re honest, it’s going to be those most popular baked-in macOS apps where the Touch Bar will be well-used – as well as some regular third-party apps that have oft-used functions you need to use while typing, such as in Microsoft Word or Outlook. Touch ID is very cool to have, but you’ll still need your password if your Mac has been reset or has been asleep for a couple of days, just like iOS devices. So what do we think about the new MacBook Pros? In a word, stunning. In another word, expensive. But we love seeing awesome stuff here at T3, and these machines plop firmly into that category. There are many nice touches, too. You can customise the Control Strip, the small section of system controls on the right-hand side of the Touch Bar. Your Mac doesn’t need to be turned on anymore, just open the lid (and the startup BONG is also gone, too, sob). The larger Force Touch trackpad is designed for much more expressive gestures than were possible before. The stereo speakers are pretty good for a notebook, but they're no substitute for external audio, naturally. Liked this? Check out our guide to the best laptops.